A Glyster for ye wound R. Mallow leaves. Cammomile. Mercury. Pelitory of ye wall mugwort and penniroyal of Each a small hand full. 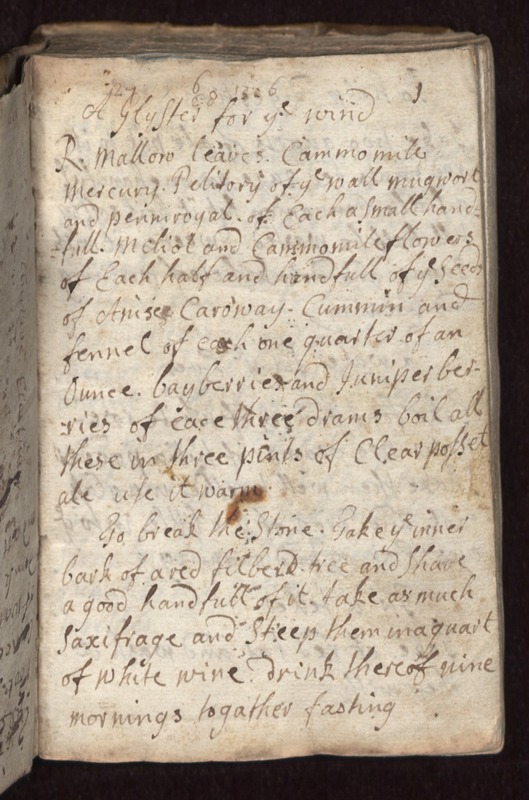 Meliol and Cammomile flowers of Each half and handfull of ye seeds of Anise Caroway. Cummin and fennel of each one quarter of an Ounce. bayberries and juniper berries of each three drams boil all these in three pints of Clear posset ale use it warm To break the stone. Take ye inner bark of a red filbert tree and shave a good handfull of it, take as much saxifrage and steep them in a quart of white wine. drink thereof nine mornings togather fasting.